we’ve come to the last post in our week of the Springvent calendar with Clorox. hopefully you’ve found some time and space in your week to add some of the projects we’ve gone over and if not, there is always next week to give it a-go! 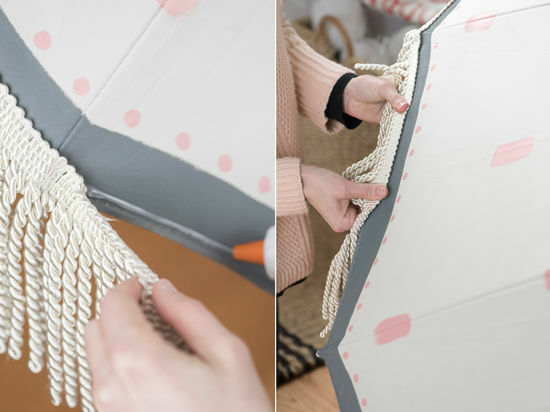 we wanted to end the week with a fun DIY to get you ready for the warmer months ahead, a DIY outdoor umbrella! the whole project can be completed for less then $100 and is a high impact addition to any outdoor space. you may want sketch out a few designs to come up with a plan, dots, dashes and stripes all look good and are easy, if you are inclined to get more complicated the options are limitless. we wanted ours to have a bit of a hand painted feel and opted for dashes, dots and a few other design elements to pull it all together. 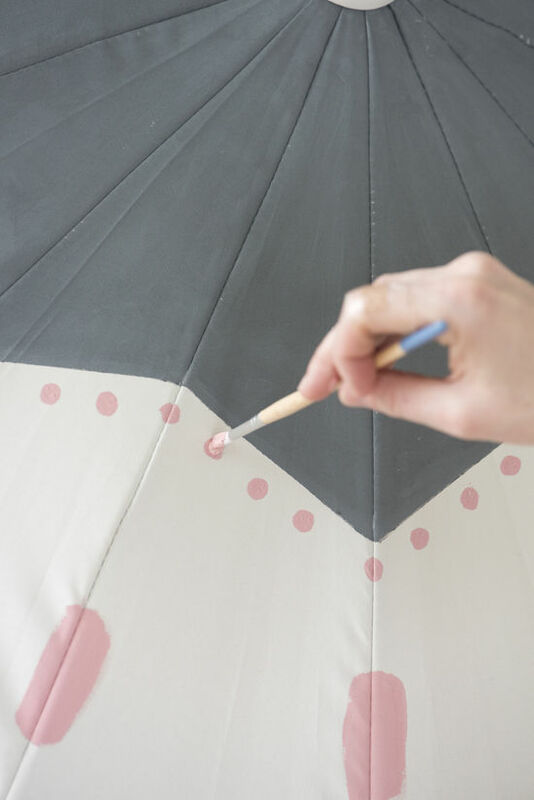 with a warmed up glue gun adhere the fringe to the edge of the umbrella. ta-da! 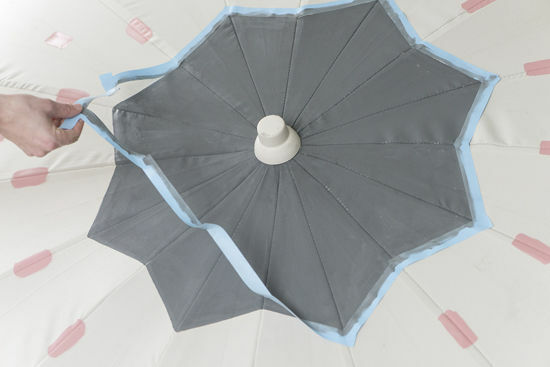 a new outdoor umbrella for your space! my patio is my happy place. i love spending time out there, hosting friends for drinks, having small celebrations or just eating dinner with my boyfriend. it’s definitely my favorite part of my house and it’s really important to me to keep it clean and orderly. we recently got a ton of rain in LA and it really did a number on my patio furniture and tile. pillows got moldy, there was mildew on the furniture and the tile was straight up dirty. 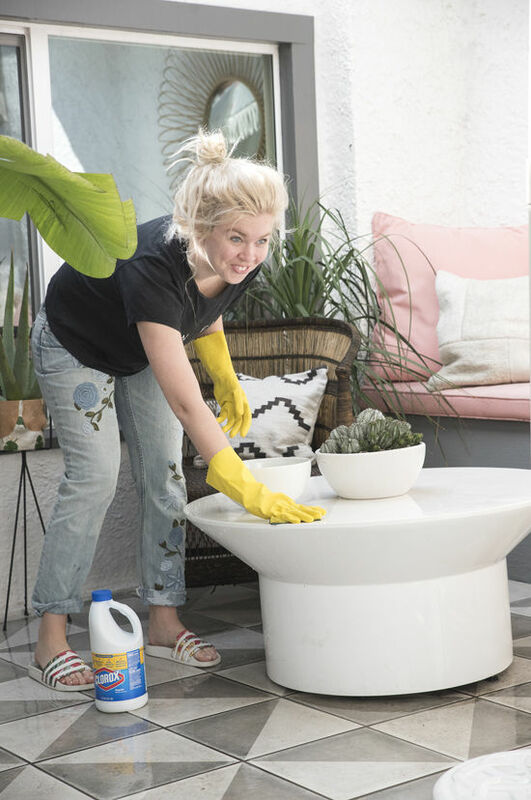 it sounds kind of crazy but it honestly upset me to see my favorite space like that so i spent an hour out there scrubbing and hosing everything down and it made a huge difference. i used Clorox regular bleach and also their outdoor bleach. 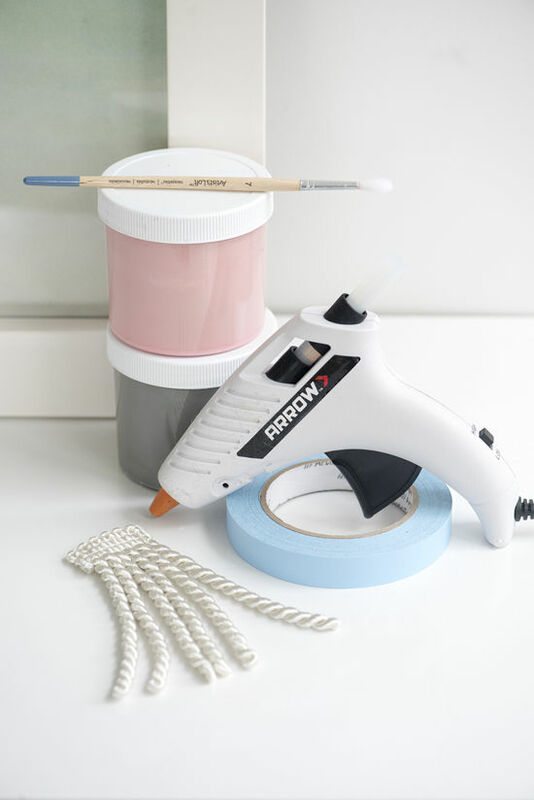 i followed this guide on how to clean everything and i recommend you do the same to find the right measurements and treatments. (this post was created in partnership with Clorox. thank you for supporting the companies that allow us to create original content for you!). 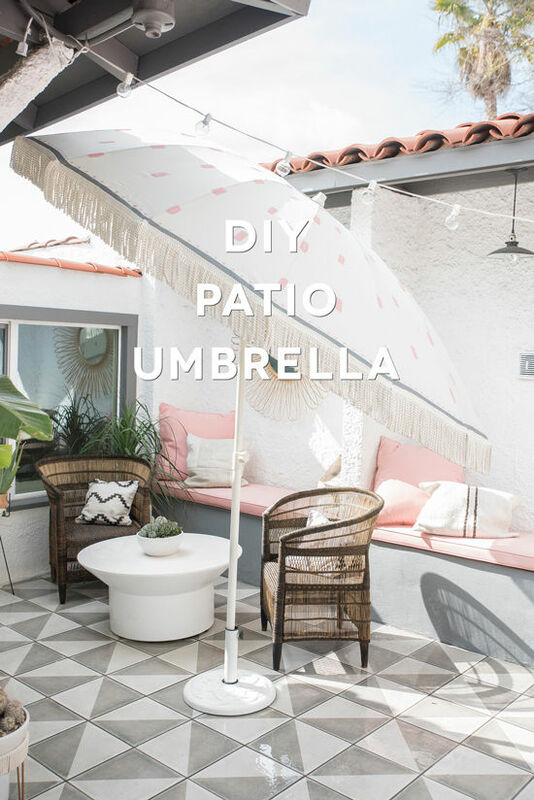 The umbrella looks adorable and your patio is so charming! I would spend all day out there! Where are those cute clog shoes from? Wow! 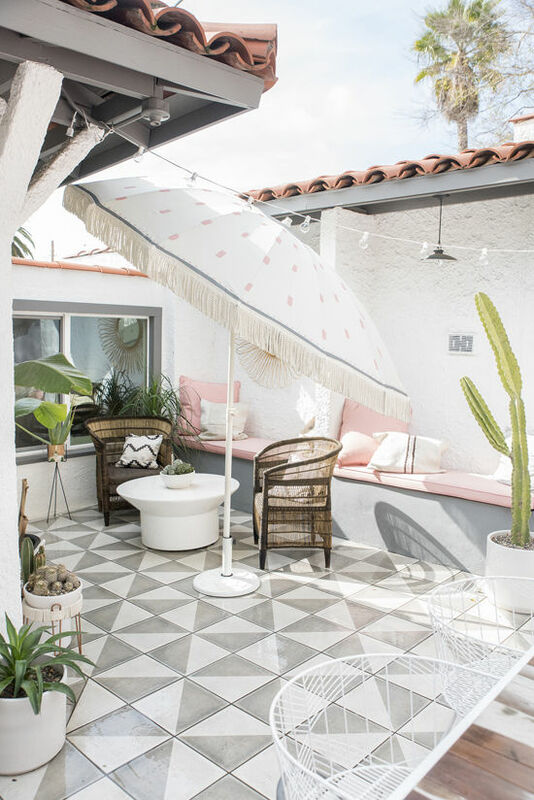 What an amazing transformation of a patio umbrella! I love how you can make even the most mundane things have their own personality and quirk. It is so subtle, but adds so much more to your already incredible backyard space! hi there! is the umbrella base also from ikea, or where? thank you! i love this project. I went crazy trying to find an affordable fringe umbrella this summer… with no success. Next spring, this is on my to-do list! Awesome! Great idea. I thought about painting a mandala, it should look beautiful !! 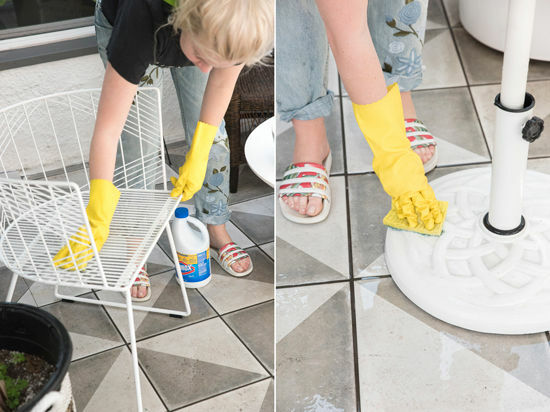 Can you tell me the name / source for the floor tile? I love the pattern. Thanks. Such an exciting ideas. Thanks For Sharing this great post with us. Wow! Lovely !!! Really beautiful design..